Roasted new potatoes is a great recipe for a dinner party or a crowd. Once the potatoes are in the oven, there is nothing to do. It is so simple, yet they are truly delicious!!! Special thanks to Shelley Menninger for this recipe. 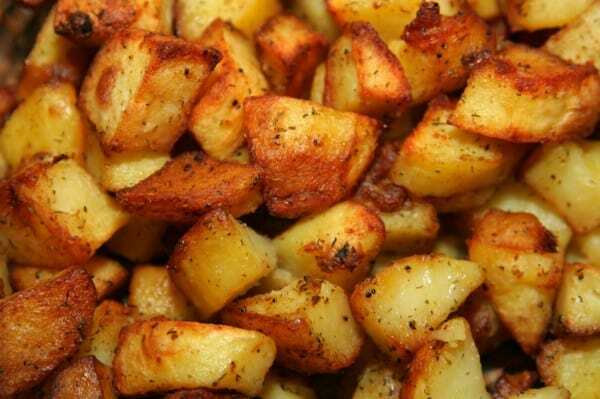 Roasted new potatoes are a super easy side dish to make. You can use as many potatoes as desired, if they are small I generally have at least 3 per person. Preheat your oven to 450 degrees. Wash potatoes, pierce and place in a long oblong dish (I like glass the best but you can use aluminum). Coat potatoes with a good quality olive oil and turn potatoes to distribute, make sure there is some excess in the bottom of the pan also. Spread kosher salt over all and roast potatoes, turning occasionally for 1 - 1 1/2 hours. If they are new potatoes, no need to turn them or pierce or even cut them – can cook them whole or in 1/4 wedges, takes about 40-45 min tops in pre-heated oven. Good olive oil is a MUST with these. Also, peppering over potatoes with ground paprika, bit of black peppers and adding few onions cut in 4 pieces (wedges) into the mix (just mix them in so they mingle and you can take them out later) will add that extra flavor. If you are a fan of hot stuff – slice up few small chili peppers, get 50-70 g of butter (about 3-4 soup spoons? ), mix chillies in butter, put in a cup, heat the mix up (microwave will do well, just do it gently as re-heating) and pour over potatoes when they are ready. Aroma is to die for! If you bake potatoes whole, you can cut them open when they are ready and add some salted cottage cheese and pour over with chilies in a butter.